Home / Products / Dimmable GU10 Halogen replacement 6W LED Cool White – 2 left! Dimmable LED Halogen Replacement Bulb – CoolWhite, 60 degree beam width. At 3 hours use per day, these should last over 25 years! This LED lamp has been designed as a direct drop-in replacement for GU10 halogen lamps. It has a 6W COB (Chip-On-Board) LED that produces over 500 lumens of brilliant light. SKU: LEDGU10_6W_CW60. Tag: Energy saving. This LED lamp has been designed as a direct drop-in replacement for GU10 halogen lamps. 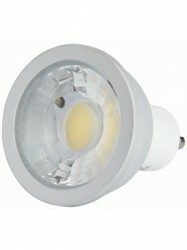 It has a 6W COB (Chip-On-Board) LED that produces over 500 lumens of brilliant cool white light. Also, unlike the halogen equivalent that generates high levels of heat, these LED type GU10 lamps generate very little heat and are therefore safer. These have a Colour Rendering Index of 80. Built in a cold forged aluminium housing, heat dissipation is far superior to most LED downlight globes, to help you get the full 30,000+ hour life expectancy. If saving power and lasting a lifetime weren’t enough, they are also dimmable! These ARE suitable for use with our DownMitt.